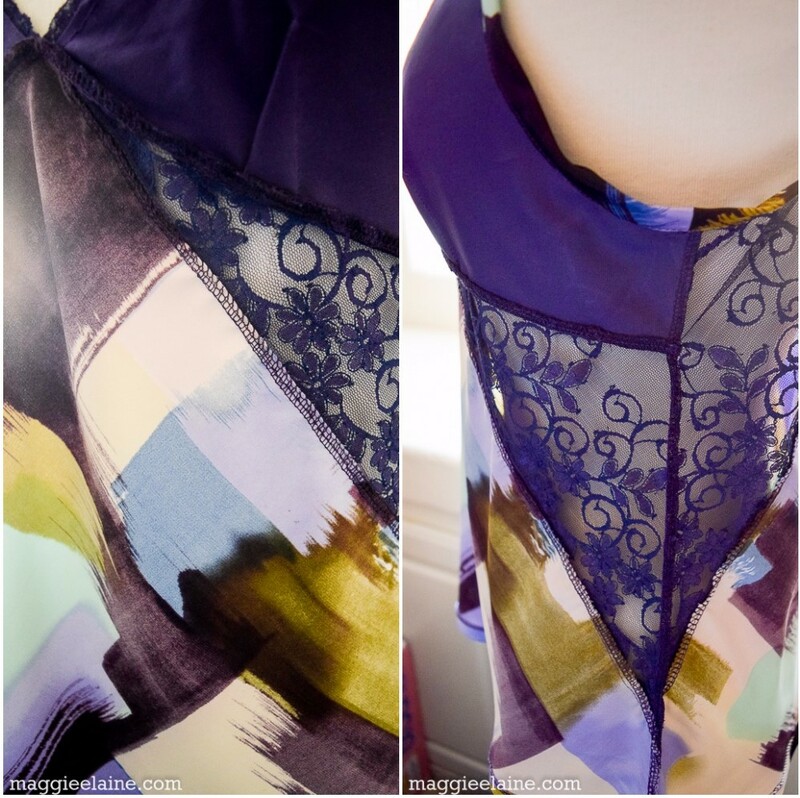 I am so excited to be sharing my first post with Fabric Mart as a guest blogger. My interactions with the team have been so great and I must say they are very prompt at providing service. Now let’s talk about my DIY look! I like to lounge around my place in over-sized T-shirts and PJ bottoms, but at least once a year, typically around the holidays, I like to buy a pair of nice pajamas/lounge wear. While perusing Vogue patterns, I came across V9218 and had to add it to my stash. As I was deciding on my Fabric Mart project, I thought to myself, “Hey why not make you a nice pair of PJs/lounge wear this year”. So I did! 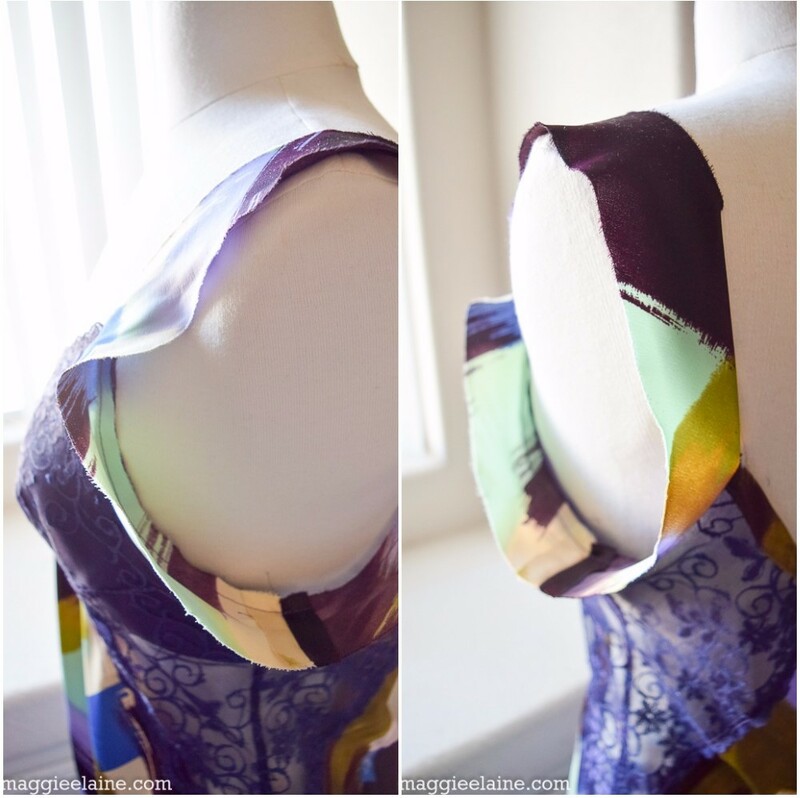 I made views C and F.
I chose this beautiful 100% polyester charmeuse from Fabric Mart. 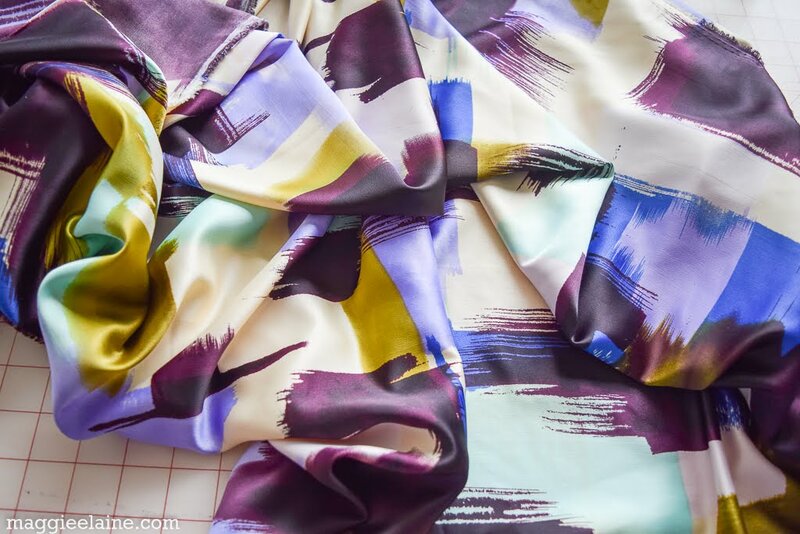 The print on this fabric looks like paintbrush strokes that blend together an array of colors…plum, lilac, pea green, seafoam green, ivory, cobalt blue, and sky blue. I did not fuss with matching the print up, because I could tell the brush strokes were going to flow very well without doing so. This fabric is now sold out; however, Fabric Mart offers more choices in polyester and silk charmeuse at great prices, so take a look! They are always getting in new inventory! As I type this, I have on my lounge wear and it is so soft and comfy. I pre-treated the fabric by washing it in cold water on gentle and drying it on low heat. It came out perfectly and is not a wrinkly-prone fabric. In the future, I will wash it in a lingerie bag to protect the lace. I used a microtex 70 needle to stitch this project together. This pattern was rather quick and easy to make. Neither of the local fabric stores here in Vegas had the pattern in a size 6-14, so I ended up buying the 14-22. I wasn’t worried about the size for the bottoms, because my backside usually needs a size 14-16, plus I like bigger PJ bottoms. However, I did think I would have to size the top down quite a bit, because I usually need to make 8-12’s for my top (depending on the pattern). Well, turns out I was wrong! After seeing the finished measurements for the bust and hip, and knowing I wanted a loose, flowy fit top, the 14 worked. In retrospect, when I look at this picture below, I probably could have taken the bust sides in more under the arm, but it really doesn't bother me. I was given a bunch of my Grandma Maggie’s beautiful vintage lace from when she made camisoles and slips for sale back in the day. I found this really pretty deep purple from her stash and thought it went with this fabric perfectly! So I used it for the contrasting lace panels. The only problem was, the lace was a bit too narrow for the contrasting pattern pieces. So I decided to stitch the lace together to create a bigger lace panel. Basically, I overlapped the lace and stitched it together with a zig-zag stitch. When laying the pattern piece on the lace, you need to line the edges of the piece along the inner edge of the lace scallop. These directions are provided on the pattern piece. That’s how you end up with the pretty scallop along the bust and side panels. Another note is to pay attention to the seam allowance and stitching directions on the pattern piece and instructions. 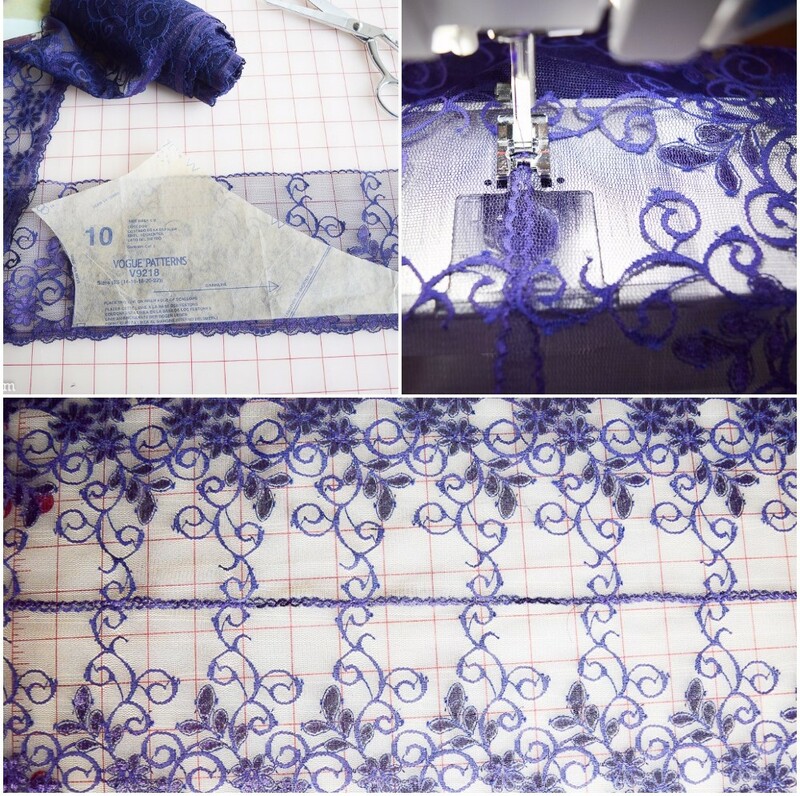 You need to overlap and stitch the lace on top of the fabric for certain parts. I was somewhat worried that the seam of the stitch where I adjoined the lace together would fall in an odd place, but I got lucky, it looked fine. Both sides are symmetrical. For the bust pieces, you need to line your pieces…or not…it just depends on how "Fredericks of Hollywood" you are trying to get with this look. I used jet knit as lining and basted the lining to the bust lace piece. 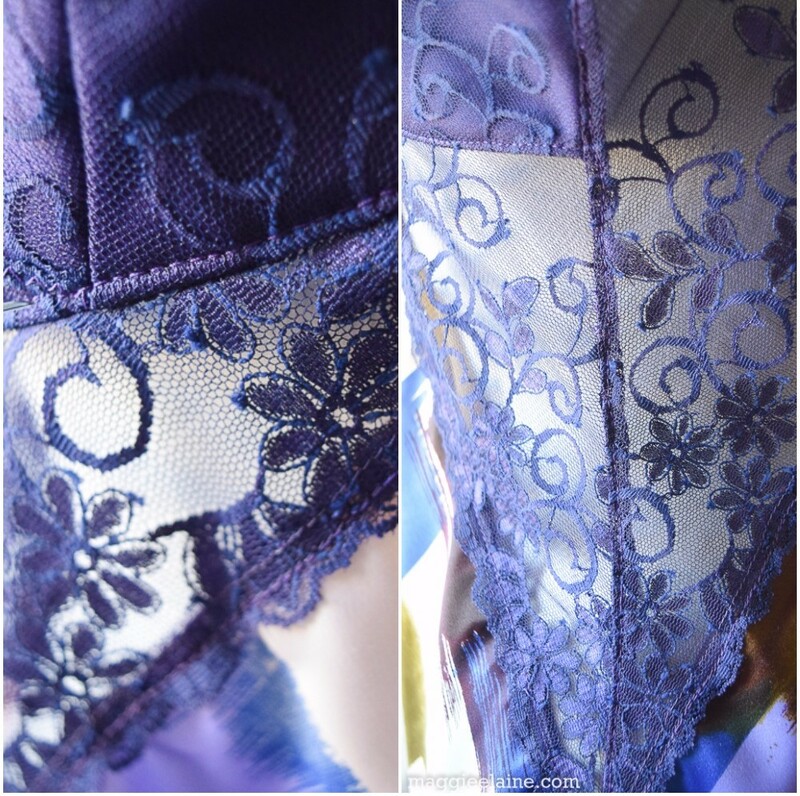 The rest of the lace panels are not lined, so you really get to appreciate the beauty of your lace. Now in all transparency (no pun intended), I had a bra on for photo purposes, because this cami does not offer support (at least not for me). However, I removed the bra for this picture to show the virtue of the pattern design. Don't worry no wardrobe malfunctions here, LOL! 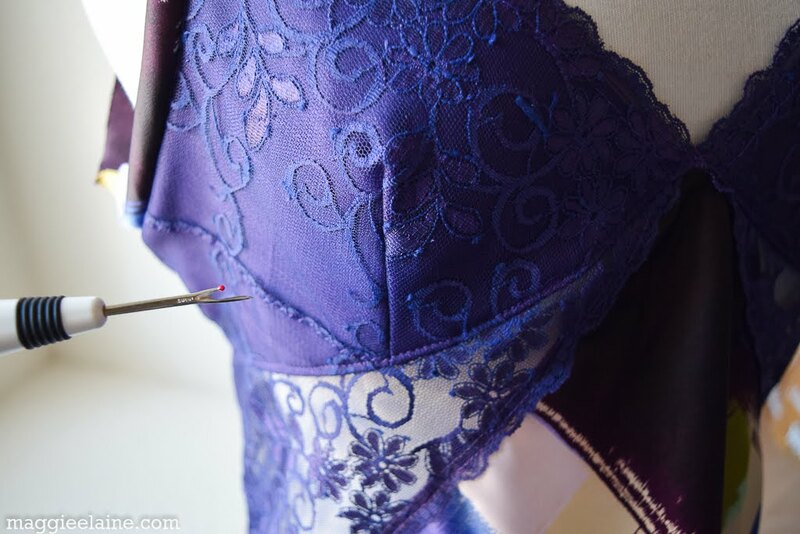 I don’t believe this is in the instructions, but from my experience working with lace and sheer panels, I like to stitch the seams down, so they do not look sloppy and go in different directions under the see-through portion of the garment. 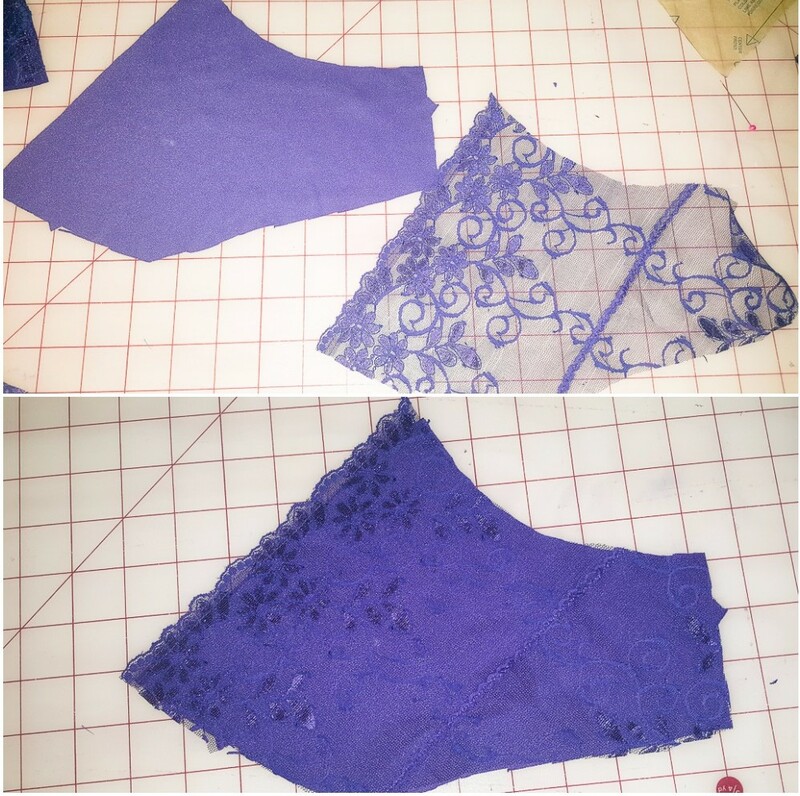 So I stitched down my seams under the bust cup and down the lace to keep the seams in place and in one direction. I believe the instructions just have you press them in one direction. For view C, I especially love how the straps are made. The arm facing and straps are one. 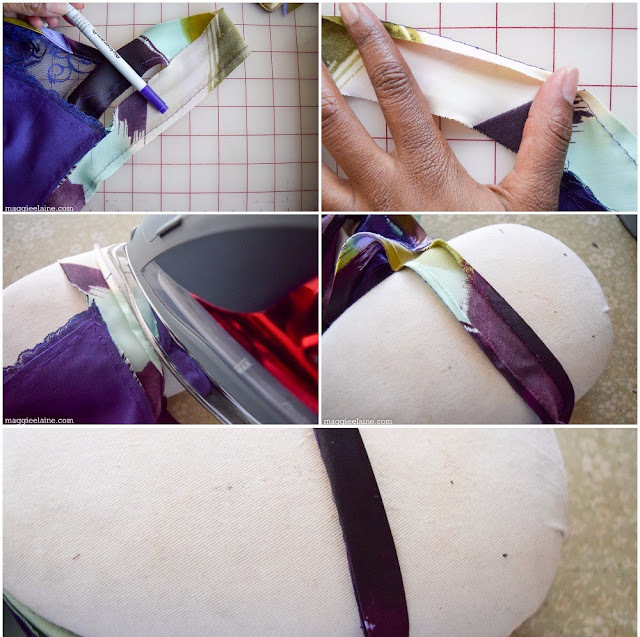 All you have to do is attach it, fold it over, press in your edges and stitch. No fuss! Prior to folding in the edges, I stitched a basting stitch as my fold line. I just find it easier to fold and press down a circular piece this way. I remove the basting stitches after I have it all stitched together. Another highlight for me were the bottoms. I don’t love elastic “squeezing me” around my waist, which is another reason I opt for larger PJ bottoms. When I am relaxing at home, I like to “unsuck” my stomach in, LOL. The cool thing about these bottoms are the elastic is in the back only, the front does not have elastic. So I don't feel so constricted around my belly, but at least I have the extra stretch from the back elastic. I added an additional top-stitch along the front waistband across the top. I am short, 5’1” (and a half) and I could have shortened the hem a little more, but it was a personal preference not to do so. I like the length to kind of fall on my feet, helps keep them warmer. For the insides, I serged it all. The directions have you double-stitch, but it is not necessary with a serger. Also, I did not cut and stitch down my bust darts per the instructions. I don’t like cutting darts unless they are super bulky and these are not. I hope you enjoyed this DIY and have a lovely Thanksgiving!!! This is a beautiful set! Lovely combination of fabrics! So pretty and thanks for all the details on sewing lace! Very inspiring! This is beautiful! Love the fabric and lace combination, works perfectly. Your details regarding sewing the lace were very helpful. Thanks Linda!Glad the details were helpful! Your new lounging set is absolutely beautiful!!! Thank you for your very detailed description of the construction of your new set. Thank you Arlene and no problem! I think it's always fun to read the details on how things are made. Wonderful colors and love how you combined the lace with the print. Comfy and chic! Go head Maggie! 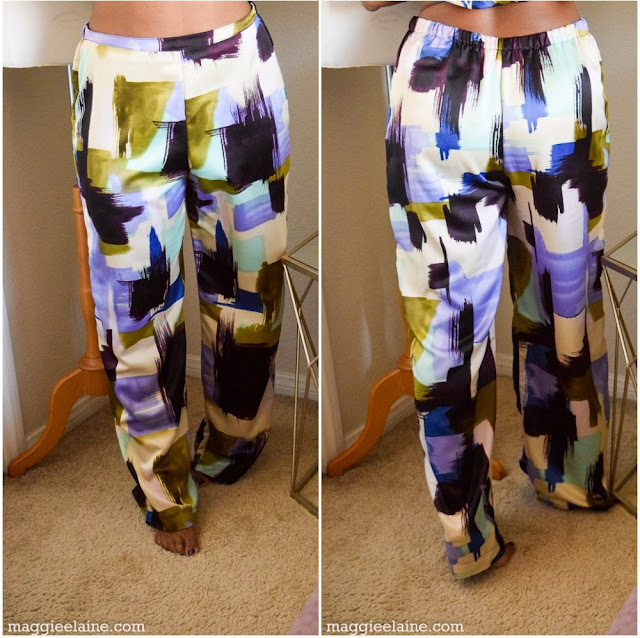 Awesome Grown folks lounge wear and beautiful details! Lol! Thanks Michelle! Yes, and I think I am going to make this in all black one day too. So easy to make!